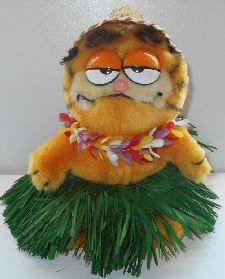 Here is a plush Garfield dressed in a grass skirt, wearing a lei around his neck and a straw hat that say Hawaii on his head. 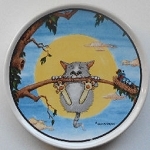 Garfield is 7" high x 6" wide, including the grass skirt. Mark on the tag says Garfield copyright 1978, 1981 United Feature Syndicate, Inc. By Dakin. Previously owned but in good condition.